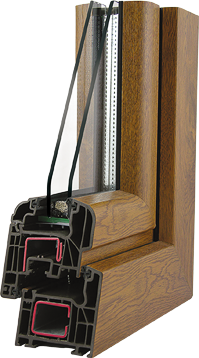 depending on profile combination and the glazing type, one can obtain a noise suppression coefficient Rw for the entire window at the level of over 40 dB. Please note that the window panes are the key factor affecting heat-saving parameters, therefore the use of triple-glazing for the Classic system assure approximately the same parameters as for CT70 CAVA windows. However, we recommend CT70 CAVA or SI82 RONDO / SI82 CLASSIC windows for triple-glazing.